There are a variety of different complaints that are common during an initial comprehensive chiropractic exam with our patients. As a Denver chiropractor, one of these conditions that patients often enter our doors for is sciatica or at times those who believe they have this traveling leg pain. Sciatica is a term used for pain felt along the sciatic nerve. This nerve runs from the lower back into each leg, controlling many of the leg muscles while also providing sensory information to the brain. Many people feel pain along the back of their leg and immediately come to the conclusion that it is sciatica based on stories they have previously heard. While it is true that sciatic pain does travel down the back of the leg, there are many other conditions that need to be ruled out as well that can be confused for this pain. Chiropractors perform a comprehensive exam including a detailed history of the pain complaint. It is very important to inform your doctor of chiropractic a detailed account of the pain and symptoms you are experiencing. Doctors find which orthopedic, neurological, or muscle testing needs to be performed based on your health history and your description of your pain. Additional imaging or testing can be ordered, if needed. These tests will let the doctor know if the pain is truly sciatica or if another condition is producing similar pain. These tests will also let the doctor know where the sciatic nerve is being affected. That means that this nerve can be irritated in numerous locations by a number of different things in the low back or leg. 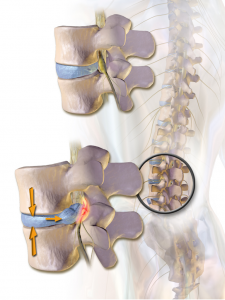 Common conditions that typically produce sciatica are a disc disease, lumbar stenosis, piriformis syndrome, a disc herniation or protrusion (a bulging disc) just to include a few. Obviously, conditions of the lumbar spine frequently produce this pain due to the nerve leaving the lumbar spine and traveling past the piriformis muscle in the leg. Whether it is muscle tissue or bone conditions that are contributing to the pain, doctors of chiropractic have a variety of methods they can use to reduce radiating pain, or give a proper referral to a specialist, if necessary. If you know someone in Denver or surrounding areas of Wheat Ridge, Arvada, and Lakewood who has experienced pain down the back of their leg, typically described as electric, sharp or shooting in nature. Schedule today by calling our clinic at 720-242-6251 or schedule online!